ILLUSTRATES HOW DECISION-MAKING IN ORGANIZATIONS HAS TO GO BEYOND ECONOMIC CRITERIA AND THE INDIVIDUAL LEVEL, DUE TO THE IMPOSSIBILITY OF MAKING DECISIONS THAT DO NOT AFFECT OTHER HUMAN BEINGS. THE AUTHOR REVIEWS THE CONVENTIONAL ANALYSES OF DECISION-MAKING THAT DO NOT TAKE INTO ACCOUNT HOW DECISIONS AFFECT OTHERS AND SUGGESTS AN ALTERNATE MODEL. 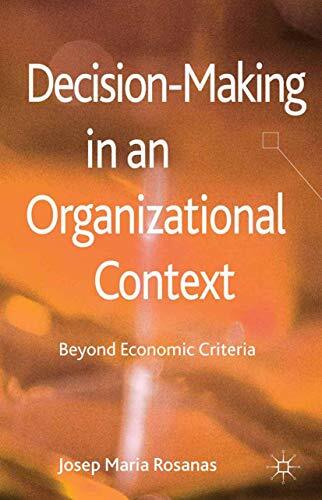 The author of this volume illustrates how decision-making in organizations has to go beyond economic criteria and the individual level, due to the impossibility of making decisions that do not affect other human beings. The book first reviews the conventional analyses of decision-making, including the classical analysis of uncertainty and the multiple criteria decision-making with qualitative aspects, that do not take into account explicitly how decisions affect other people. Following this, the author puts forward a model for analyzing decisions, which takes into consideration the effects on other people. 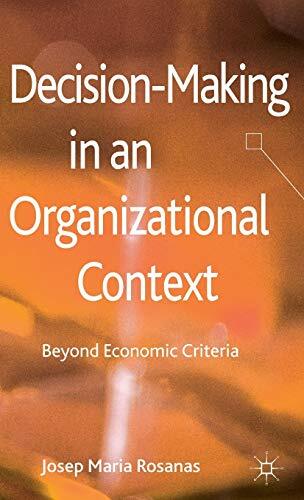 Decision-Making in an Organizational Context highlights the consequences of organizational decision-making and suggests the principles of effectiveness, attractiveness and unity of the organization that should guide it. The volume finishes up by applying this framework of analysis to real-world situations.